Easter’s over, but the bonnets are still on display for one more week at Bard. Be sure to catch Hats: An Anthology by Steven Jones, with significant historic headwear pulled from the stellar collection at the Victoria & Albert Museum in London. It’s three stories of mini-collections grouped into themed cases for Helmets, Turbans, Hoods, Straw, Paper, Felt, Feathers, and Flowers. The surprise is trying to decide which are contemporary, vintage, or truly antique. Typically here in the States we don’t get to see gems such as a knit wool apprentice cap from 1550 London, and a leather jester’s hat from the 1600s. More modern chapeaux include a case of NYC designers (Eugenia Kim and Patricia Underwood), a felt beret from Mary Quant, a creation from Lola Hats made entirely of The New York Times, and many, many celeb hats, including those worn by Maurice Chevalier, Gypsy Rose Lee, Leigh Bowery, Mick Jagger, Cecil Beaton, the Mousketeers, and Warhol’s wig. 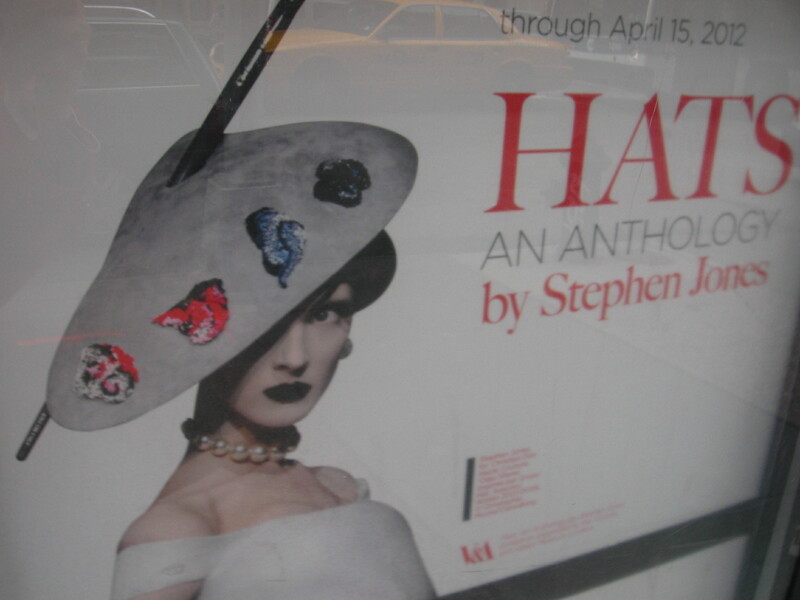 Check out the on-line highlights and the installation views, (or the client salon or the gallery from the original 2009 V&A show) but there’s no substitute for experiencing three stories of creative, delightful, and historic hats in person. This entry was posted in Art, Museums and tagged art, culture, fashion, museums, style by mssusanb. Bookmark the permalink.